C63 AMG HEADED TO SA: Mercedes-Benz C63 AMG will be launched in both sedan and estate guise in South Africa early in 2015. Image: Mercedes-Benz. LONDON, England - Mercedes-Benz has revealed its new C63 AMG in both sedan and estate variants and, yes, they are headed for South Africa. The new sedan will arrive in the first quarter of 2015, estate later that year. Local pricing and specifications will be announced closer to the launch date - when we get them, so will you. Each variant has the same M177 four-litre biturbo V8 as used in the new AMG GT two-seater, though it can be tuned to either standard or 'S' guise. In standard from, the engine is capable of 350kW/650Nm and 375kW/700Nm for the C63 S version. According to Mercedes-Benz, the C63 AMG S sedan will reach 0-100km/h in four seconds, making it the fastest AMG C-Class yet. 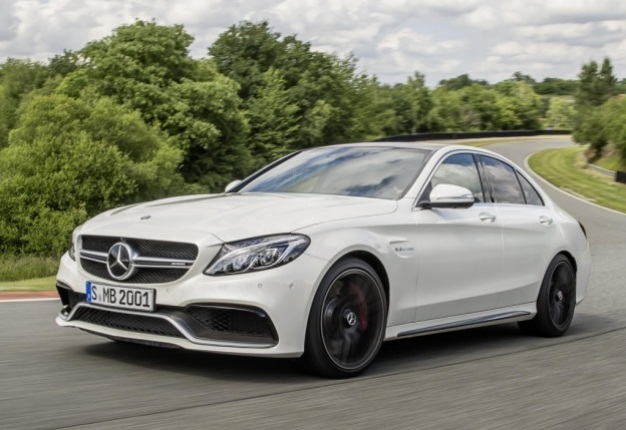 The engine is mated to a seven-speed AMG Speedshift MCT-7 transmission, offering "significantly quicker shift times" and drives through a mechanical limited-slip differential on standard versions; 'S' versions will have an electronic locking unit. The C63 uses four-link suspension, independent steering knuckles and a wider track to improve stability, while at the rear its multilink system uses independent mounts. Both are linked to AMG ride control, operating through electronically-controlled three-stage dampers offering different driving modes from comfort to track settings. The standard version has 245/40 R18 (front) and 265/40 R18 (rear) tyres while the ‘S’ model uses 245/35 R19 (front) and 265/35 R19 (rear). A new braking system uses 390mm discs at the front and 360mm at the rear with the option of enhanced ceramic discs for track-orientated driving. Built using the automaker’s 205 series aluminium and steel chassis the sedan weighs 1715kg, and the estate 1785kg (including fuel and driver). New front bumpers with deep air dams feed the intercoolers and it benefits from a unique AMG grille and a new bonnet with subtle power domes. Unique, wider front wings (to clear the wider front track) sport V8 biturbo badging. A new rear bumper houses quad exhausts. The cabin's deep and contoured seats are set behind a small, unique AMG wheel and re-calibrated dials. AMG sports seats are an option along with a range of different leather treatments and trim finishes (from black, carbon and aluminium). The controls for the AMG Ride control, the optional AMG performance exhaust system and the three-stage transmission modes are grouped around the standard Touchpad controller.